Our sincere effort, based on our company philosophy, is sure to satisfy every need of both groups more than ever before. We are sure that we are doing the right thing in the right way and we will continue to pursue our candidates' success. Please visit the page, "Candidates' Voice" where you can find some feedbacks from our candidates about our career consultation, and also the page, "Advice" where you will learn some more about our philosophy and beliefs. 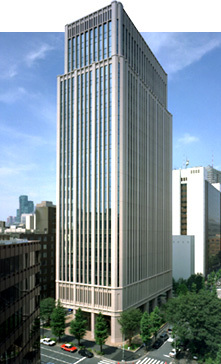 >1-minute walk from Ginza-line(Tokyo Metro) Toranomon station 9th or 7th exit. >2 to 4-minutes walk from Kazumigaseki station of either Chiyoda-line(C2 exit), Hibiya-line(A12 exit) or Marunouchi-line(B3a exit). 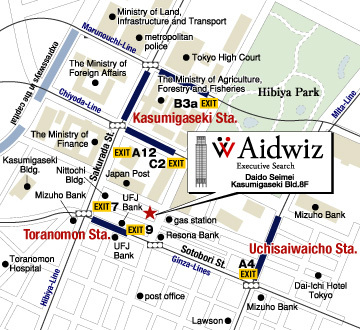 >4-minute walk from Mita-line(Toei Metro) Uchisaiwai-cho station A4 exit. Copyright (c)2003-2011 Aidwiz All right reserved..